There are many girls out there who have been dumped by their bodybuilder boyfriends for reasons unknown to them. They were probably just told that he needed more time, or some other crap like that, yet although this might be true in one out of hundred cases, in most of the others the reason was completely different. We’ve approached several bodybuilders who’ve dumped their girlfriends in an attempt to discover the top reasons for dumping. The same applies for athletic girls that decide to dump their boyfriends. Bodybuilding is all about nourishing your physique. When you’re ripped guy that pays attention to his muscles, and your girlfriend is neither lifting nor squatting to save her life, you’ll probably dump her sooner rather than later. In any case, you’ll dump her for sure. 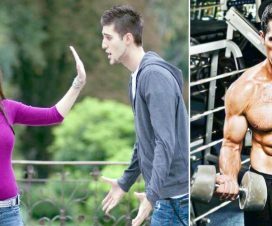 Bodybuilders can’t stand being in relationship with someone who isn’t doing anything to improve one’s physique. Finding your fridge stacked with cooked chicken and rice after an exhausting workout is the coolest thing you can give to any bodybuilder. What’s not cool is when your girlfriend comes home from a party in the middle of the day and vomits herself next to you while you nibble of on your dry beef steak. Partying and bodybuilding just don’t go hand in hand. When you’ve first met both you and your girlfriend had perfect bodies. She used to take care of herself, and she looked as the most beautiful girl in the world. However, this no longer holds true. Once your relationship has settled, she decided that her looks are no longer important. She got fat, stopped practicing and improving her look. At the same time you’ve remained the same old guy, just better. You’ve gained an inch on your arm and are still looking for a way to improve your physique with every passing day. To put this in perspective, lets imagine that in the beginning of your relationship you’ve both scored 8 out of 10 for your looks. When the score for her looks drops to 7/10, and yours jumped to 9/10, you’ll probably start thinking about damping her. You know you can do better, and you also know that she’ll only get worse. Bodybuilding is more than a hobby. For most of us it’s the main passion in our lives. In order to make solid gains bodybuilders give their all at every workout, planning their meals, often eating blunt food. No one should dare underestimate their love for the sport, nor devalue its importance. Lest of all their life partner. Girls that don’t appreciate your passion have no place in the life of a bodybuilder. After investing hours upon sweating hours in the gym to swell up those muscles, you’ve finally came to the stage where you can throw away all your medium T-shirts replacing them with the more respectable L-size. Yet, when your birthday came, you find out that your girlfriend once again bought you a T-shirt labelled M. Bodybuilders subconsciously interpret this as a subtitle hint from her that you’ve lost your gains and should. Nobody wants that kind of negativity, and the chances are that you’ll dump her.